As I’ve mentioned before, I don’t consider myself brave. My first reaction is to shrink back rather than charge forward. “I am afraid” is one of the limiting beliefs I’ve been doing battle with all my life. And while I’ve found work-arounds for times when I need to push through feeling fearful, I’ve never actually thought about fear in a positive way. 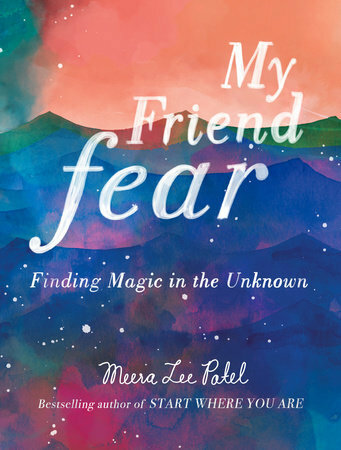 Last week I picked up a pretty and deceptively simple little book, My Friend Fear: Finding Magic in the Unknown (2018, TarcherPerigee), by Meera Lee Patel. Just like reading The Upside of Stress changed my attitude towards stress, reading My Friend Fear triggered a change in my attitude toward fear by helping me see it in a new way. Fear will always be there when you step outside your comfort zone. All learning and growth occurs outside of your comfort zone, so unless you want to stop growing, you will always have some fear. The only way to get over being afraid of doing something is to do it. The doing comes first, then the fear fades. Everyone feels this way—I’m not an anomaly. Fear is my friend. It shows me what matters to me. My tendency has always been to think something was wrong with me when I felt fear, and to push it away instead of listening to it. Or I’d become paralyzed and overwhelmed—the antithesis of flow. After reading these two books, I’m changing my response to fear. Instead of trying to “overcome” fear, I want to learn how to be comfortable with it, and with being afraid. I’m no longer going to feel like I shouldn’t be afraid, or that I should just ignore fear and push ahead. I’ll be looking on fear as the friend who highlights the areas of my life that matter the most, the areas where I’m stretching outside my comfort zone. 2018 is already giving me opportunities to test this theory, with new writing projects on the horizon, the chance to help teach a yoga and journaling workshop this weekend, and, in October, a chance to travel to Paris with Laure Ferlita and The Blue Walk. Do you welcome fear into your life? What would you do if fear were your friend? Dear Kathy this was a great post on fear...to tell you the truth - I do my best to avoid it instead of embracing it and making it my friend. Thanks for showing me there are other ways to deal with it. Hope you have a wonderful day. Hugs! Debbie--I've always done the same, tried to avoid fear or overcome it, rather than treating it like a friend. It's all in the perspective--and I hope this perspective makes life easier for both of us. Rita--fear often takes the form of nervousness for me, too. Maybe it's a less extreme form of fear, but still one that sometimes keeps me from doing things I'd like to do. Also known as "resistance". I'm glad you found the post helpful--I have to say that changing my perspective on fear is already helping me, so I hope it helps everyone else also.